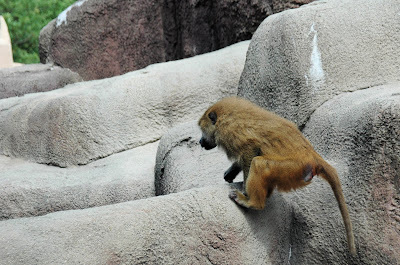 Baboon climbing rocks at Baboon Island in Brookfield Zoo. Thanks for stopping by. Tomorrow will be the last of my main Brookfield Zoo posts with the Ring tailed lemur. I will be doing some features on their Butterfly Exhibit in August but tomorrow is the last of the mammals. If you would like to see more of my photography, visit my Artfire studio The Shutterbug Eye.